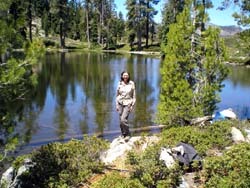 Twenty-one years ago Barbara and I first met on a July backpack to Stoddard Lake in the Trinity Alps Wilderness. Perhaps I should call it two backpacks, converging. Each of us hiked in along a different trail with different companions. But there beside Stoddard Lake, amid a group of mutual friends, we first encountered one another. I showed her wild columbine growing in a wet place in the meadow. Twenty-one years! They say the cells of the human body replace themselves absolutely every seven years. If it is true, then over a span of twenty-one years our corporeal presence has recycled itself three times over, the old cells hauled out to the dumpster like coffee grounds morning and night. In seven years, the Common Law presumed a missing person dead. Death might thrice have been presumed in our twenty-one years, for who among us has not lost his way in the upwelling which ceaselessly inundates and befuddles us? Who is this Barbara? I found myself wondering. My hiking companion, sharing meals, sleeping beside me at night, this Barbara whose body had been completely reconstructed thrice in the flow of our acquaintance. More fundamentally, who is the I that asked? How could I, who had myself been churned by the years into this alien reincarnation, peer down that arthroscope of memory to the joint in time when first we met beside the placid waters of Stoddard Lake. So many years ago. The truth is, it did not matter. Barbara and I had grown together during these past twenty-one years, entwining our lives like the contorted branches of whitebark pine at timberline, each supported by and protecting the other. The year before, we had contemplated returning to Stoddard Lake for a twentieth anniversary backpack. But Spring rains had washed out the roads, and by Summer the mountains were ablaze. So this anniversary backpack would have to be our twenty-first. The Fourth of July is usually a bad time for backpacking. The rabble are loosed from their chains of employment for a three-day, or, god forbid, a four-day weekend. But in 2007, that annoying holiday fell smack in the middle of the week on Wednesday. So on Saturday morning we ventured forth from Blue Lake, motoring east to Weaverville on Highway 299, then north on Highway 3 to the Eagle Creek Loop. We could find no road signs. Meticulously they had been ripped down by local miscreants bent on saving that corner of wilderness for themselves. The gravel road began south of the Ripple Creek crossing and climbed steeply. Without road signs, we used the GPS, a map, and dead reckoning to find our way through the maze of unmarked logging roads. A half mile from the trailhead, the road buttonhooks sharply right in a steep, rocky switchback, which had just been reopened by the Forest Service after washing out the previous year. At the trailhead (N 41 09' 33.9", W 122 43' 25.9"), we sought reassurance, but the elaborate Forest Service kiosk had been stripped of any useful information. 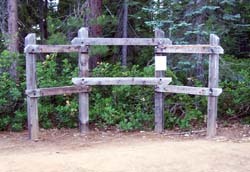 Only a single sign remained, a recent posting warning us of bears. In the horse trailer turnaround at the end of the road we parked the van for the night. A magnificent snag loomed over our campsite. A few inept mosquitos whined around us, but had little interest in biting. All that evening we were serenaded by the haunting, spiraling melodies of hermit thrushes. In anticipation of our first backpack of the season, I did not sleep well. Dread slithered in and out of my dreams on poisonous centipede feet. The further I drifted from rational thought, the more caustic the blistering footprints. The prospect of physical pain was there, yes. The pain of heat. The pain of cold. Rain. Wind. Starvation. And fear of wild animals. Mosquitos. Ticks. Rattlesnakes. Bears. Cougars. Rodents slobbering ebola or rabies. Physical breakdown seemed likely. A twisted knee. Heart attack. Hypothermia. Old age. Disease. Death. But worst of all loomed the vast vague dread of something unnameable going terribly wrong. Something unanticipated. Something outside my customary circumstances. Outside my control. We had not backpacked in almost ten months. I had grown older. Too old, perhaps, for all this fuss. Barbara had undergone knee surgery in January. A March biopsy revealed I had caught cancer in my prostate, that little-loved organ in the center of my nether regions. Surgery loomed in three weeks. And there was the hassle of getting ready. Making sure the backpacks contained just the right thing for every critical need, yet were light as clouds. Should I leave in the snake bite kit? It weighed two ounces, and we had never been snake-bit before. Dared I take a peach? Nothing could be left undone. Nothing left to chance. Madness. Madness. Chance is the ground we walk on. Happenstance the air we breathe. No, I did not sleep at all well. So many decades of backpacking. Why did we still have to backpack at all? As the stars began to fade in the east, I wondered aloud, "Do I really enjoy backpacking anymore?" I told her I was losing sleep worrying. "You've always worried," she grunted, rolling away. "As long as I've known you." It was true. I recalled prior years and decades of tossing in the van until first light allowed us to rise and confront our demons with the meticulous task of final packing, followed by the first tentative steps on the trail beneath a burden that always seemed too heavy. But then, almost at once and without fail, with the first steps the healing began. Worries born of too much rumination burned away in the agony of the hike. Perspiration washed away doubts. What became real was each single step, the dusty trail, the starkness of chaparral and timber, the blue sky, the breeze, the haunting calls of the wildlife. And when that first day was done, the cares of a lifetime have been neutralized in the pain of the hike, and the pain itself had evaporated into nothingness. Ah, then could we begin to perceive the trees and the rocks and the birds as if for the very first time. Welcome them into our hearts and breathe the exhilarating splendor of the wilderness. Sunday morning we arose at first light, busied ourselves with breakfast and final packing, and were on the trail by 8:30. The first half-mile climbed the shoulder of a rocky moraine through a tunnel of dense chaparral, low manzanita, rhododendron, and heath, beneath a canopy of various scrub versions of oak and chinkapin, until the trail opened on a tilting green meadow encompassed by huge incense cedars and firs. 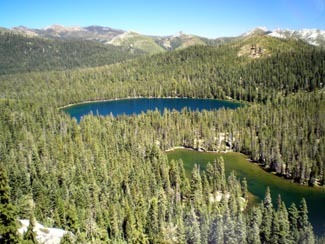 A short, stout cedar in the center once held a sign marking the junction with a steep, two-mile shortcut up and over the ridge to Stoddard Lake. The sign was gone, but we recognized the junction, having hiked that way together once before. The Forest Service no longer maintained the rugged cutoff trail and had deleted it from the maps like a bad dream. The old sign had probably been stolen, like all the rest. 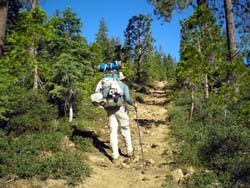 We elected to stay on the maintained trail, which, though longer, rose more gently as it circled north and west high on the rusty ultramafic slopes above Eagle Creek, soon revealing a splendid view of Mount Shasta in the distance. Eagle Creek, unseen in the trees and brush far below, separated the landscape of peridotite and stunted forest through which we hiked from the rounded granite domes and cracked white spires of the Craggy Peak Pluton above Big Bear Lake to the north. We had been there once, too. In a half hour we crossed a clear stream feeding a boggy meadow glistening with the shiny green hoods of California Cobra Plants. Carnivorous, they thrived in the wet ultramafic soil. The trail continued circling westward, then climbed southwest to a divide separating the Eagle Creek drainage from the East Fork of Coffee Creek. We stopped to rest, then dropped south into the open mixed conifer forest of the upper East Fork, where we met an elderly man with a knee brace hobbling out from Stoddard Lake. After exchanging knee stories with Barbara, he informed us that no one was left at the lake and tried to describe the route to a fine campsite beside a meadow he and his group had just vacated. His directions made no sense, so we let him go. A short time later, his son and three other men passed us. At last we encountered our first trail sign. Old and bleached, its information was as skeletal as the ancient board into which it was carved. An arrow pointed right to "Doe Lake." Actually, that right-hand fork was the upper end of the East Fork trail, and in another half mile it would intercept a separate trail rising to Doe Lake. I had camped there once before, and if Barbara's knee remained sound, we would perhaps return on this trip. Our agenda was amorphous. Instead we took the left, unmarked fork and crossed two tributaries of the East Fork at Stoddard Meadow, a broad pocket of grassland and brush whose ultramafic soil supported a sparse forest full of dead and dying timber. The trail was rough and rocky from the erosion of years of horse traffic, but I pushed our pace lest someone else beat us to that unoccupied campsite we suspected to be our anniversary destination. On and on the trail climbed eastward, entering denser mixed-conifer forest, until finally it crested a dusty rise at Stoddard Lake's 5843-foot northwest corner. 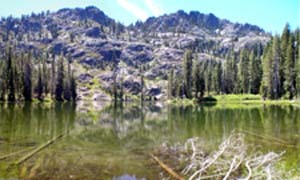 A good fisherman's trail circles the large lake, and we followed it south, counterclockwise, crossing the outlet steam on logs and arriving at last at the big horse campsite on the southwest shore between the lake and a wet, grassy meadow (N 41 09' 02.5", W 122 45' 27.8"). The campsite was empty. Dropping our backpacks, we looked around, remembering. There was the narrow clearing between the big camp and the water, where I had set my tent. Without question, this was where we had met 21 years ago. The hike in had taken two-and-a-half hours. Scarcely had we sat down to enjoy our solitude and good fortune, when we heard voices, and a small, wet dog tried to jump into my lap. A young couple arrived herding two dogs. They had hiked in the long way on the East Fork trail, a seven-mile, 3500-foot climb, and had camped a night along the way. Discouraged to find the best campsite taken, they wandered down to the meadow and set up a tent in the grove beyond. I was pissed. No one else was camped at the huge 25-acre lake, and these people decided to set up their tent within a hundred yards of us. Like a goddamned state park drive-in campground with flush toilets and screaming children! I wanted to go over and say something, but Barbara said, no, let them be. The trees would screen us. Besides, we were lucky to have our anniversary campsite. The day was cool and windy. Barbara took her binoculars down beside the lake, while I wandered around identifying red and white fir, lodgepole pine, groves of mountain hemlock, a few towering Jeffery or Ponderosa pines, the long cones of a sugar pine, ferns, and corn lilies in the understory. The meadow was filled with shooting stars and columbine and alder groves. The biodiversity was matched by a geological diversity: white granite, red peridotite, green serpentine, gray or black metamorphic rock, intruded with granite and veins of quartz, incredible frozen porphyritic rocks. "Rick!" Barbara called. "Come here! Quick!" I scampered down to the water, and she handed me the binoculars, pointing to a speck in the sky. I focused in on a black bird with a white head, white tail. "Is that a bald eagle?" "Two of them," she chortled, pointing to a second raptor rising over the trees and gliding toward us. For an enchanted ten minutes we watched these magnificent birds of prey wheel above us in an ever-tightening gyre, until at last they alighted and perched, one above the other, in a tall white fir at water's edge a stone's throw away. In wonder we watched them, waiting, expectant, but like that ebon bird of Poe's dark rhyme, they "perched and sat and nothing more." Never had a bald eagle perched so close by us. Much less two. What did their arrival portend? Did they have some momentous message to share with us, like the Ghost of Old Judge Waldo a year before? Were we in store for a screeching "Nevermore?" Or perhaps they had returned to this place for their own anniversary celebration? A bald eagle can live 30 years in the wild. Had they hovered around us here on Independence Day twenty-one years ago? Before long I wearied of watching them watching us watch them. Most likely their arrival was dumb, blind coincidence, a random convergence in the meaningless Unfolding. 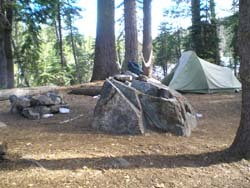 So I returned to the campsite and strung the hammocks among a red fir, a huge white pine, and a white fir at the vortex. Barbara joined me to set up the tent. When we looked for them later, the eagles were gone. We would not see them again. That evening we sat beside the lake until it grew dark, then kindled a small warming fire. The couple in the next camp had ignited a roaring blaze. As we retired, I mumbled about conserving resources and leaving no trace. Barbara reminded me that on the trip when first we met, our raucous group had staggered around a monstrous conflagration drinking whiskey and braying like donkeys long into the night. Monday morning the wind had quieted. I had slept well. We meditated on our little sand and gravel beach beside the still lake water. Insects whirled and skimmed the surface. Fish jumped for their breakfast in silvery Olympic bursts and showy back-flips. Chickadees and nuthatches picked bugs from the trees. Juncos scratched for seeds in the duff. All was right with the world. Barbara's knee, though not pained, crepitated oddly at times and left its reliability in doubt. As we finished breakfast in our hammocks, a group of youths passed through from Camp Unalayee. None were born when Barbara and I first met here. One of the leaders, a young man named "Niko," knew my secretary's daughter Zea, who used to work at the camp. Small world. 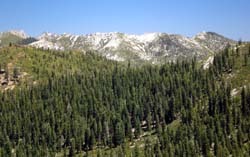 They were headed to Upper Stoddard and thence cross-country to Holland Lake below Billy's Peak. Leisurely we hiked around the lake and found the campsite at the southeast corner, near the end of the shortcut trail, where we stayed last time. We searched for the abandoned trail, but found no trace. Open slabs of bare rock sloped into the lake before plunging to its depths. The slick-rock ledge was an excellent spot for a swim, and the water was refreshing. After toweling off, we lay naked in the sun's warmth and ate lunch. Osprey above and Great Blue Heron along the shore hunted for fish. From the ledge I watched a dragonfly zig-zagging six inches above the water, while beneath it a fish traced its precise jagged path, like a surreal reflection, closing in with carnivorous intent. Back at camp, we explored the meadow, finding columbine and a profusion of shooting stars. The sound of music wafted into our camp. Down by the water's edge, while her companion fished, the young woman from the next camp sunned herself in a skimpy bathing suit, her favorite tunes broadcasting from some sort of high-tech device in her hand. The music sliced through the tranquility like a cleaver. RESPECT FOR SOLITUDE. The true wilderness enthusiast comes in search of quiet and serenity. Respect your solitude and that of others by leaving sufficient space between camps, and by leaving radios and boisterous conduct at home. I was ready to go down and show it to her. Don't camp so close to others! No radios! No music! No massive campfires! Keep quiet! Barbara, of course, said no. She reminded me of our own gaudy bacchanal at this same spot, when we met those many years ago. These were the ways of youth, and now a new wave rose and loomed in the endless precession behind us as we approached our final somber crash upon the sands. Tuesday morning we sat on the peaceful shore, sipping our tea and mocha. The day was windless and already growing warm. The couple from next door ambled into our camp, hitching their heavy packs for the long hike out. They turned out to be students at Humboldt State University in Arcata, living in Mckinleyville. Practically neighbors. Though I longed to harbor my grudge, these young backpackers were hard not to like. Todd was studying pre-med and had backpacked since he was a Boy Scout. Pleasant and bright, he wanted to hike all the lakes in the white Trinities. Kelly was new to the sport, but enthusiastic. They had hiked into Tangle Blue Lake in May, crossing snow on her very first backpack. I savored the hearty stew of uncountable backpacks that lay ahead of them (while ours tallied down to a tepid gruel). How could we not wish them the best? And then we were alone. At last we had the lake to ourselves. We decided to hike to small Upper Stoddard Lake, but not up the steep scramble of the outlet waterfall as Mr. Popper had always led us. We would circle up from the west via the moderate route we always found on our way back down. I relied on the print-out of a DeLorme map and GPS coordinates from Google Maps. In the end, Mr. Google nailed the location of Upper Stoddard Lake, but only after we had circled too far to the right and found ourselves in steep, rocky terrain leading to the ridge crest. We backtracked to the more gentle swale that rose from the meadow beside our camp. As we ascended, splendid views opened of Stoddard and McDonald Lakes in the valley below. Beautiful Upper Stoddard Lake (N 41 08' 38.5", W 122 45' 29.3") has always been one of my favorite places. Carved into the metasedimentary rock at the cliff's edge at 6351 feet, its outlet stream spills over the rock face and down the steep escarpment. Although 500-feet higher than our lake, the water temperature was perfect for swimming. No campsites were evident, but we decided that some day we could eke one out for a night in the rocks above the southeast shore. Perhaps when we returned for our fortieth anniversary. We ate lunch on a massive red rock outcropping with a commanding view of the valley (N 41 08' 40.4", W 122 45' 25.9"). McDonald Lake lay directly below, pinched in the middle like an hourglass. Larger Stoddard Lake lay further north. Beyond the forested valley rose the granite spires of the Craggy Peak Pluton. To the west stood the Doe Lake cirque and the pass into the North Fork of Coffee Creek. We would not be hiking there this trip. From our perch we watched a group of backpackers circle east around the north shore of Stoddard. The hike back down was much easier, once we knew the lay of the land. We returned to camp to find a middle-aged man and his black dog at the campsite Todd and Kelly had just vacated. Why did everyone want to cluster together like barnyard fowl? He came over a little later and introduced himself as Ray. His dog was named Que. The day had grown hot, into the 80's. As we relaxed in our hammocks that afternoon, a young couple from Pleasanton passed through our camp. They had backpacked in along the North Fork of Coffee Creek and had spent one night at Granite Lake, then crossed over the divide via Doe Lake. They planned to stay one night at Stoddard before hiking back out down the East Fork to complete a loop. Then they would drive up to Swift Creek and hike in to Granite Lake and the Four Lakes loop around Silago Peak. They intended to pack as much wilderness trekking into their week's vacation as they could endure. As if in competition, perhaps only with themselves, they would bag the peaks, check off the lakes and trails, and move on, never needing to return. How would they remember this trip twenty-one years from now? Wednesday morning we sat by the water with our tea and mocha. A junco scratched. Stellar's jays awakened, squawking. Barbara pointed out a tiny spider parasailing toward us on a gossamer thread. Right at me it came. When the thread snagged a branch, the spider rappelled down and landed on my rain jacket folded next to me. I brushed it off rudely, then regretted my lack of compassion. A lonely deer in the meadow broke our morning meditation. Then a flock of red-breasted nuthatches swarmed in to inspect the trunks and branches around us like a bug- eradication crew, dangling upside down or walking headfirst down the vertical trunks within arm's reach, their songs the four tin-horn beeps of a backing tractor. A nuthatch snagged an inchworm, and in an instant another was on him for a piece. Chickadees joined the fluttering hunt. Having studied it from above, we decided to dayhike to McDonald Lake. A shallow creek trickled from the upper lake and joined our lake through the green sward of our neighbor's meadow. We found and followed a faint use trail along the creek that rose a gentle 200 feet to the log-choked outlet of McDonald Lake. There we took a fisherman's trail around the brushy west shore to the high rocky promontory at the lake's hourglass waist we had seen from Upper Stoddard. At the end of the trail, just inland from the promontory, lay a good campsite. Unable to bushwack further or around either side of the promontory, we scrambled over the rocky dome and found a fine smooth slab for swimming. No one else was around. We ate lunch beneath the stony headwall of the cirque. The lake felt very secluded. The headwall looked impassable, so after lunch we circled back around to the eastern shore and found another large campsite, abandoned and littered with fallen branches, directly across from the promontory. At one-sixth its size, McDonald Lake is more intimate and more alpine than Stoddard, and for those seeking solitude, the campsite near the rocky promontory would do fine. In the evening, an osprey splashed near our camp. I do not think he caught anything. As it grew dark, we surrendered to the night and the blazing Milky Way. Then, our allotted time expiring, we crawled into the tent for our fourth and final night at Stoddard Lake. Like as not, we would never see this place again. The Fourth of July arrived as any other morning. No parade. No flags. No fireworks. It was going to be hot for our hike out. Blazing sun and perspiration. But first we sit beside the mirror lake on our blue mats sipping tea and mocha, swallowed by the buzzing of a thousand insects. Pollinators. Clear sky, except for a few vague vapor trails drifting east. Later in that calm morning, a pattern of high cirrus would turn the vapor trails into wispy feathers. Dragonflies dance over the water, do-si-doing around each other, dropping to kiss the mirrored surface. Fish, some eight inches long, explode into our rarer medium like Olympians in training. Expanding rings pass through one another. Before the wind comes up. Before the beginning of time. I "see" their motion in the everyday moment. Just how wide is the present moment, in which all consciousness takes place? The rising sun casts long shadows. I do not "see" them move. With a shadow, it is different. To perceive the motion of a shadow, I must mark a leaf, a twig, a stone, and then look back a few moments later to see if the line between light and dark has advanced. This is not short-term memory. This does not arise in the "present moment." The movement of shadows is a fabrication of the mind. Albert Einstein wrote, "People like us, who believe in physics, know that the distinction between past, present, and future is only a stubbornly persistent illusion." Is this not the legacy of our larger brains? Natural selection favored the construction of a "past" from which we could model a "future" in which to plan our actions. Risk was minimized. Advantage increased. But somewhere we lost our way. We came to believe in the substance of history. But neither past nor future has ever been real. Never substantial. Ever have they been figments. Like the memory of our having visited here twenty-one years ago. Where has that visit gone? Did it ever really exist? Did we ever exist? Lines from Kenneth Patchen drift through my mind. And lines from Jorge Luis Borges. I will read these lines to Barbara someday. Someday, when this is no longer the present moment, but a stubbornly persistent illusion. One day I shall try to breathe life back into this, when I write my wan account of our twenty-first anniversary backpack to Stoddard Lake. I shall not succeed.